MOSCOW, December 14. /TASS/. The Russian Orthodox Church expects European political and religious leaders to properly evaluate the infringement of believers’ religious rights in Ukraine, spokesman for Patriarch Kirill of Moscow and All Russia, Rev. Alexander Volkov, told TASS on Friday. 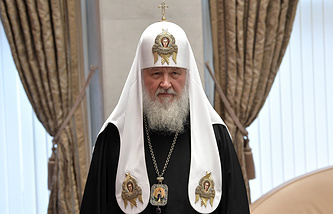 The primate of the Russian Orthodox Church earlier addressed the heads of the Local Orthodox Churches, Pope Francis, Archbishop of Canterbury Justin Welby, UN Secretary General Antonio Guterres, French President Emmanuel Macron and German Chancellor Angela Merkel over mass violations of rights and freedoms against the Ukrainian Orthodox Church’s bishops, clerics and believers. "The purpose of the Patriarch of Moscow and All Russia’s appeal is to draw the attention of European religious and political leaders to major problems concerning the observance of human rights and freedoms in Ukraine. Since the Ukrainian authorities neither hear themselves nor their citizens, the primate of the Russian Orthodox Church who takes care of his flock in the Ukrainian Orthodox Church made an appeal to European religious and political leaders in order to focus their attention on what is going on in Ukraine," he said. According to Volkov, the Russian Orthodox Church primate expects European religious leaders to hear his message. "As always, when a certain confrontation flares up, Christians should stick together and voice their concern together. Therefore, the patriarch addressed the primates of the Local Orthodox Churches, the pope and the Archbishop of Canterbury as the most respected and influential spiritual leaders in Europe, whose voices, we hope, will be heard by those who are bent on Europe, I specifically mean the Ukrainian authorities," he stressed. Volkov noted that the French and German leaders shouldered certain responsibility for the developments in Ukraine within the "Normandy Four" group. "We know how carefully the Ukrainian authorities react to any appeals from European leaders and hope that will be the case now too, because people’s basic rights and freedoms are being violated, and what’s really terrible is that they are being infringed on religious grounds," Volkov said. At the same time, the appeal by the leader of the Russian church is not a precedent. "The patriarch addresses both the pope and the primates of the Local Orthodox Churches in connection with some extraordinary events. That was the case not so long ago in light of the case with Syria," he stressed. "We often hear calls for observing human rights around the world. Now, the time has apparently come to formulate these calls and words more clearly and purposefully with respect to what is happening in Ukraine."